The production of cutlery has been relatively consistent since the industrial age – the mass production allowed by new factories meant that cutlery was eventually found in almost every home in Britain. Before the industrial revolution, utensils used for eating were made using simpler methods, such as waterwheels and horse-driven wheels. Before this, cutlery like spoons and forks were hand carved from wood. 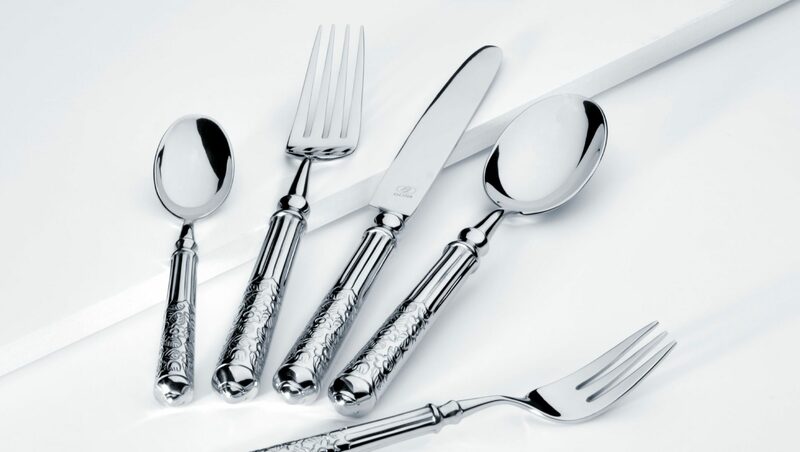 With the development of the industrial age, increased sophistication in cutlery production became possible. With cutlery being-mass produced cheaply and efficiently, people looked towards improving the form factor of their utensils. The possibility of creating cutlery that felt good to eat with, rather than just being functional, became possible. Thus, the hollow handled knife was created. These hollow handles, with their rounded nature, were found to be far more comfortable to hold than their flatter brethren. The process of making hollow handled knives is not an overly complex one, although the added time and cost associated with these steps contribute to the higher prices of these knives. In lesser-priced cutlery sets, knives are stamped from one flat piece of steel, which is a reliable, cheap and efficient way to make mass-produce cutlery. Hollow handled knives are made in two steps. First, two separate strips of metal are shaped to form a handle. These two pieces are then soldered together. The handle at this stage is aesthetically and tactilely very rough, so the metal is buffed and polished to the point where the obtrusive seam of the handle is removed. The blade and handle are then fused with an epoxy, a powerful cement, which then forms a bond between the metal. The bond is one that is incredibly strong, and designed to last a very long time. Hollow handle knives can either take the form of dinner cutlery or knives used for cooking. In the case of cooking knives, the lightness that the hollow handle allows for more accurate slicing and chopping. The heavier handles found in solid handled knives might benefit more aggressive chopping motions, but the extra weight can be considered as a negative trait in cooking rather than a positive. As previously mentioned, the handle benefits eating due to the easy, comfortable grip that is formed with the use of a larger handle. Hollow handles aren’t typically used for cutlery besides knives, as the hollow handle in knife benefits the cutting motion more so than the motions associated with knives and forks. Next time you’re holding a hollow handled knife, make sure to remember all the extra little steps that went into it to make it more comfortable!